The day started out with an announcement made by Jane Hoffman of the Mayor"s Alliance with a special message from Mayor Bloomberg: Hereby September 19 through September 26, 2010 is Best Friends Animal Society Strut Your Mutt Week in New York City. There were muffled barks and the roar of motorcycles in the background. 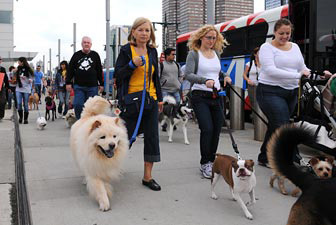 The crowd was getting anxious to start strutting, and thus began the first annual Strut Your Mutt in New York City, a fundraiser that did so much more for the animals and the people of the area. Lee Flaster was walking Duke, a dog he had adopted from Stray from the Heart, an organization that takes at-risk dogs from Animal Care and Control in Brooklyn - as he was describing the wonderful attributes of his dog and why rescuing an animal is so important, Ginger Holton heard him effusing about Duke, leaned her head over and said, "I walked that dog every Saturday until he was adopted!" That is what this event encapsulated: the networking, the resource gathering, the sense of community, and of course - adopting out pets and raising funds! Not to discount the fundraising aspect, with over 750 participants and 1,000 dogs strutting, the event raised approximately $130,000. That"s a lot of funds going right back into the organizations that will help bring New York City to a time of No More Homeless Pets. That"s the money that will get the special needs animals the care they require, the spays and neuters for the folks that do rescue and for those that do trap/neuter/return, and to help keep pets in homes by providing families with the support they require during these economic times and more. 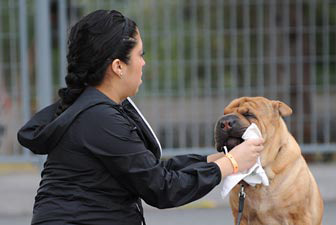 Alicia Cartenuto was there with her Shar Pei named Shampoo. Cartenuto and Shampoo were there walking for Best Friends, she had never been involved in an animal event before, and she was there with her dog to help raise money for the place that Dog Town, the show, helped make famous. She had been aware of the homeless pet issue but hadn"t been involved in a charity. "I saw the photos on Facebook from the LA Strut Your Mutt, and said "I can do that!" I knew Shampoo would love this day!" shared Cartenuto, nodding towards a very content Shampoo. From the doggy yoga, to the doggy massage, to the free doggy treats and samples - there was a lot to love going on during this day, for even the most finicky of dogs. While there was much fun and frivolity to be had at the event, there was also a very important lifesaving task at hand, raising those funds for the groups that need it. Caryl Shulman, founder of Pet Adoption League of New York, and one of the Network Charities participating in Strut Your Mutt, embodied the spirit of this year's event. Shulman"s rescue business card reads that they serve the tri-state area and Pennsylvania, a quick chat with her and it"s apparent she serves almost any dog in need no matter where they are. She"s been personally rescuing Chow Chows for over thirty years. Joining her today were Clancy and Angie (a rescued mother and son Chow Chow pair from a pound where the only surviving pup was Clancy), she also takes in special needs pets that would not survive in many shelters. Like the Jack Russell that needed an amputation and the Schnauzer that was relinquished to a local pound because he was going blind. Snowbee is now adopted to a loving home after his two lenses were operated on successfully. "What Best Friends does - bringing these groups together - and helping us raise money, is making it possible for us to do more. It"s all about making connections and helping the animals get into homes. When we"re all working together we can do so much! Best Friends has been one of the only groups that has extended help without pomp, they really want to help the smaller rescues and as many animals in need." One of Shulman"s associate said succinctly, "Caryl could be retired and enjoying her life. Instead she"s doing all she can to rescue the animals. Events like this can keep her going, she already gives all she can." Shulman mentioned she had been selling unworn jewelry to help pay for the medical operations that she funds for her rescues, and this day will help her keep some of those trinkets for another rainy day. Friends of Animal Rescue is another group that just does all they can to support the organizations that save the animals. They fund medical care, spay and neuters, and supply dog food for families in need - those funds go straight to the veterinarians, pet supply stores and boarding facilities. They were the top fundraisers of the day and they made their record breaking booty look easy. 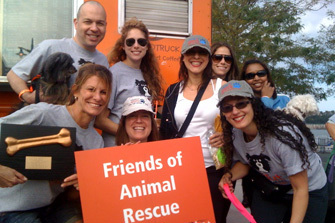 Friends of Animal Rescue was featured on CBS for a promotion of the event, click here to watch the video. "This event is so awesome and it"s great to be with people that feel the same way you do. People that want to fight cruelty and be involved with an organization that does so much for the animals, they are getting the opportunity to help Best Friends through Strut Your Mutt. Best Friends is larger than life, they are a model for saving lives and being positive. There"s a lot that is challenging about animal rescue work, but Best Friends focuses on "here"s what we can do!" It was amazing to see the pledges come in so quickly," said Betsy Goldman of FOAR. "It was so easy. We brought Gabby from Biscuits and Bath and she"s adoptable - and a great dog. She"s one example of how many great dogs are looking for homes. We have so many senseless euthanasias every day, people must be educated about spay and neuter, adoption, and the resources that are available to them," shared Michael Plosky of FOAR. "I have all kinds of friends, and for my birthday I asked that they pledge $5 for this Strut Your Mutt, so even if they were struggling, I was just asking that they give up Starbucks for a day. Everybody can give $5!" A winning remark from the top fundraiser of the day! Watch the Video from the Day from FoxNews! Become an outreach volunteer with Best Friends! If you run a nonprofit animal organization, sign up to become a Network Charity today. Donate to help animals in need.